A gorgeous debut about family, friendship, first romance, and how to be true to one person you love without betraying another. I’ve been reading some really amazing books lately! 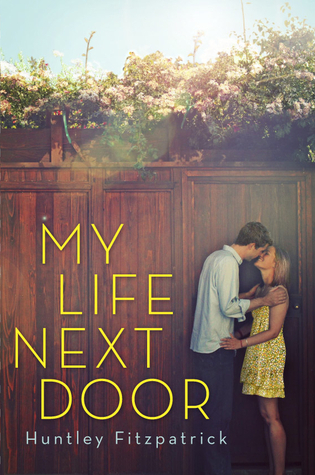 My Life Next Door is definitely one I am adding to my TOP 2012 MUST-READ list. I don’t have one complaint about this book except that I wish it didn’t end. I was so trapped in the story I didn’t want to be set free. Keep me there please! I want back in! This is a book that I can pick up once a year and reread it and it will still feel fresh and new to me. I was lucky enough to read an advance copy of it and now I cannot wait to own a finished copy. My Life Next Door has plenty of teenage drama, family issues, romance, and a tragedy to keep you entertained until the very end. I think that a lot of readers will find that they can easily relate to the characters, too. This might come off a bit weird, but I felt like a teenager again while reading My Life Next Door. I loved it! Characters: A+ - I want to be Samantha. Need I say more? If Fitzpatrick’s future books are anything like this one, I want to read them all. I loved it. The End. I cannot wait to read this book! I wish I'm not broke to buy a copy XD i'm definitely getting this one! Sounds good. I love finding those books that you can read again and again. I really want to read this book! And I'm in love with the cover! I really loved this books as well, Jase was just...*sigh* he was an amazing character! So glad you loved this one too! I have been absolutely dying to get my hands on this novel. The characters sound like they really make this novel. I'm so excited to fall in love with them myself! I usually read the paranormals, but I might have to pick up this one. Thanks for the review post. I'm glad you liked it so much! I just ordered my copy today and can't wait to read it. Thanks for the review. I read Contemporary sometimes and this one sounds like a story I should take time to read. Thanks for the review. Thanks for the review. I just may add this to my TBR list! Everyone loves this one...I guess I need to read it. I really need to try this one its nice to read something besides paranormal every once in a while!!!! Sounds like a cute summer read. I can't wait to read this! I finally bought my copy yesterday. :) Looking forward to meeting Jase's family! Ever since I first saw this on Goodreads, I've been dying to read it. It looks like a great contemporary read, love the premise. Haven't we all had those families we wish we were a part of. I think I'll completely agree with your review, "I want to be Samantha." This one sounds perfect for summer. Can't wait to get my hands on a copy. Oh I loved this one too! This is my new "recommend to random strangers" book. The Garretts are a wonderful "character"! It sounds just wonderful. Thanks for sharing your review.